The Minneapolis Star-Tribune has enough problems without having Par Ridder as publisher. So, he ought to do the right thing and resign. Apart from whatever legal consequences result from Par’s reported admission that he purloined trade secrets from his former employer, the Pioneer Press, the case is a major distraction for his current newspaper, whose finances faltered almost immediately upon its acquisition by a group of New York financiers. Barely three months after the Minneapolis Star-Tribune was sold in February, its operating profits were 20% lower than projected by Avista Capital Partners, which acquired the paper from McClatchy. The shortfall is the reason why the highly leveraged paper recently dismissed 7% of its total staff, including a much deeper cut in the newsroom (see Comments below). If the newspaper can’t improve its sales, it would have to cut still more expenses to avoid defaulting on its loans. At the same time 145 of his colleagues hit the bricks, Par callously plunked down $2.7 million for a 100-year-old mansion in one of the swankest parts of town. Beyond poor taste, the purchase of the costly-to-heat edifice – which includes a heated outdoor pool – reflects remarkably poor judgment in an era when enhanced energy austerity would seem to be highly advisable. But poor judgment seems to be Par for the course for this publishing scion. The lawsuit filed by MediaNews Group charges that Par spent five months gathering PiPress trade secrets before jumping to the Strib in spite of a non-compete agreement with the St. Paul newspaper. The secrets included “employees’ salaries, profit and loss data and customer lists of advertisers, along with ad revenue, ad rates and company expenses for nearly every department,” according to an account by Minnesota Public Radio. Par said he accepted the offer of his former secretary to shred his non-compete agreement at her home but chased her down in the parking lot to retrieve the document after being advised by his lawyer not to let her do so. At a time the struggling paper needs a clear-thinking, ethical leader who can focus 110% of his attention on solving its problems, Par must defend himself in court, rally a staff demoralized by major cutbacks, suffer excruciating public humiliation and try to regain the confidence of the investors who entrusted him with a $530 million asset. Having flunked most of the major tests of modern corporate stewardship, there is only one honorable alternative left. Will Par have enough sense to take it? The queasy plunge in newspaper advertising sales in May suggests the revenue deterioration that began in the middle of last year is accelerating at a dangerously increasing rate. If the decay continues quickening at an unchecked pace, it is difficult to imagine how some newspapers, particularly the marginally profitable ones, can continue to exist indefinitely as we know them. May was the worst month – so far – in what is shaping up to be a dismal year for newspaper ad sales. The year-to-year sales declines of the publicly traded publishers last month were 14.9% for Media General, 11.8% for Tribune Co., 11.5% for Journal Register Co., 11.5% for McClatchy, 9.9% for New York Times Co., 6.8% for Journal Communications, 6.8% for Gannett, 5.7% for the Ottaway division of Dow Jones and 1.7% for Lee. The table below shows the same-store, print and online ad sales of the respective publishers since the beginning of the year. These declines are hardly blips related to weather, the date of Easter or any of the other reasons that publishers invoke when trying to position their sales shortfalls as isolated, aberrant events. They are part of a steady deterioration that began in the second half of 2006 and has accelerated ever since. Advertising sales (including print and new media) fell 1.5% in the third quarter of last year, 2.2% in the fourth quarter of last year and 4.8% in the first quarter of this year, according to the Newspaper Association of America. In the first five months of this year, none of the publicly held newspaper companies reported positive sales performance, except for Gannett’s meager gain of 0.3% in January. 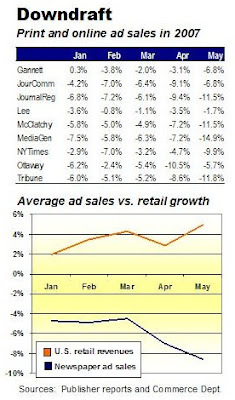 The newspaper ad declines came during a period that over-all retail sales grew comfortably in the United States, as illustrated in the graph below. With sales and, therefore profits, falling at seemingly accelerating rates, some newspapers, particularly metros, appear to have entered a period of exponential decay that eventually could impair the viability of their existing business models. In that event, papers will have to eliminate things like television guides, book sections, op-ed pages or Sunday magazines – which some already have done. Or, they will quit publishing seven days a week, skipping perhaps such ad-weak days as Monday. Or, they will stop printing papers and move to strictly digital publishing formats. Or, they will stop publishing altogether. Because many internally controllable and externally uncontrollable variables affect the sales, expenses and profitability of an enterprise as complex as a newspaper company, it is not possible to say when a given newspaper might pass the point of no return. But the accumulating evidence suggests that some are getting closer. For starters, as discussed in this previous post, the print revenues that generate more than 90% of the sales of most newspapers may be $2 billion lower this year than they were in 2006. Coming at a time of general economic well being, the collapse, if it materializes, would establish beyond question that the industry has lost its once-magical ability to achieve consistent sales growth in both good times and bad. You need look no further than recent news reports to see how the industry’s deteriorating resilience is affecting the delicate economics of such highly leveraged ventures as the Minneapolis Star-Tribune, Tribune Co. and Philadelphia Media Holdings, which each have been loaded with debt to finance the recent changes in their ownership. They are, in short, the canaries in the coalmine. Barely three months after the Minneapolis Star-Tribune was sold in February, its operating profits were 20% lower than what had been projected by the investors who acquired the paper from McClatchy. If the newspaper – which already has reduced its staff by 145 people, or 7% – can’t find a way to improve its sales, it would have to cut still more expenses to avoid default on its loans. Tribune Co. has been forced to agree to pay tens of millions of dollars a year in additional interest, because lenders are nervous about the company’s ability to generate sufficient profits to pay the interest on the $13.4 billion in debt it is borrowing to go private. “Tribune, which last year generated cash flow of $1.3 billion, will initially have to meet annual interest costs of around $1 billion when the buyout is complete,” reports the Wall Street Journal. If Tribune’s sales fall short of expectations, the only way to service the debt will be by cutting expenses or selling assets – or both. Only months after Philadelphia Media Holdings bought the Inquirer and Daily News, the Inky reported last year that the papers would have barely “$10 million” left in 2006 after paying interest of $40 million on the money borrowed to finance the transaction. The paper’s profits, noted the Inky, had fallen from $100 million in 2004 to $76 million in 2005 to roughly $50 million in 2006. There’s not much margin for error in this deal. A spokesman for PMH did not respond to requests today for an update on the company's financial health. While everyone in the newspaper business acknowledges that the good old days are gone, few people viscerally understand how rapidly the industry is coming to the point that it cannot sustain itself without farther-reaching – and likley more wrenching – structural changes than such relatively modest efforts to date as scrapping stock tables, outsourcing telephone ad-takers or even down-sizing newsrooms by 50%. Absent plans to pare entrenched bureaucracy, eliminate archaic work rules and speedily implement bold strategic initiatives to build significant and sustainable new revenue streams, the industry could find itself on a hopelessly irreversible trajectory. If it isn't there already. The overdue departure of the overcompensated Terry Semel as chief executive of Yahoo represents not only the definitive end of Web 1.0, but also a valuable lesson to other companies thinking they can successfully create undifferentiated, monolithic brands on the Internet. Although Yahoo got off to a great start as one of the premiere web directories in the pre-Google era, it followed the now-discredited lead of America Online by stretching far beyond its core competence to become a “portal,” a jack of all trades offering not just search, but also horoscopes, email, classified ads, news, picture hosting and everything in between. In its quest to be something to everybody, Yahoo ceased to be particularly good at anything for anyone. And, thus, it lost its way, putting its stock into an 18-month slump and leaving itself open to a take-over – hostile or otherwise. Among the company’s strategic blunders, as noted in this excellent article by the Associated Press, was ceding search leadership to Google, which it could have bought for a mere $5 billion as recently as 2002. Today, Google, whose market capitalization is $160 billion to Yahoo’s $38 billion, makes more money in a quarter than Yahoo earns in a year. Rather than sticking to the business that put it on the map, Yahoo until recently had strayed so far from its roots that it actually subcontracted its search function to Google. It attempted to reclaim its search advertising business only last fall with the launch of a home-brewed system that continues to sub-perform Google’s commanding pay-per-click search engine. Beyond the mistake of forsaking search, Yahoo over the years entered one online business after another with scarcely a vision or a plan, much less a cohesive approach to capitalize on the disparate initiatives. In so doing, Yahoo became the archetypal Web 1.0 company, grabbing eyeballs as fast as it could in hopes that the rapidly growing number of people newly attracted to the Internet would develop lifelong loyalties to its services. While this worked for a while, it didn’t last long, as increasingly sophisticated users recognized that they could go one place for shopping, another place for videos and someplace else for email. Innovation was rapid, the barriers to change, nonexistent, and loyalty, if there ever had been any, was a relic of the past. Thus, we entered the era of Web 2.0, an environment so thoroughly disbursed and democratized that people had a limitless choice of cheap, if not free, content and services. If they didn’t like what they saw, they could fairly well create something of their own. Yahoo, which in retrospect stands clearly as the first geezer media company of the Internet, failed to grasp the changes in the marketplace, much less adapt intelligently to them. His memo also contained valuable cautionary words for other media companies – old and new – who are struggling to stay focused in an era of rising competition and competing opportunities. For all its resources, Yahoo couldn’t get its act together. Even if you like peanut butter, don't let this happen to you. It doesn’t seem the least bit odd to see Humphrey Bogart dictating a story to the operator of a clattering Linotype machine in “Deadline U.S.A.” After all, those were the olden days and that’s how it was done. Sort of. But Robert Redford sure looked silly in “All the President’s Men,” a thoroughly modern journalism movie (to my eyes, anyway), as he pawed through a mound of clippings, reference books and telephone directories to identify a key figure in the early days of the Watergate investigation. “Do you know how fast he could have done that on Google?” I said to my wife, who patiently sat through the movie for the umpteenth time to commemorate the 35th anniversary of the break-in that broke Richard M. Nixon. The man Redford was researching was Kenneth H. Dahlberg, a Republican fund raiser who provided some of the hush money paid to the Watergate burglars. It took Google exactly 0.04 seconds to point me to this article at Wikipedia. 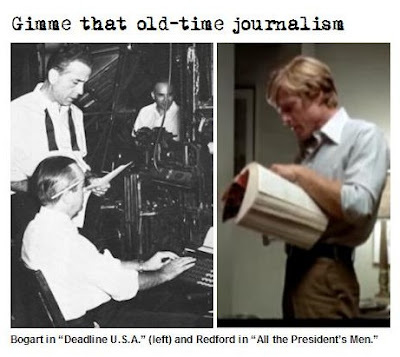 Back then, Redford as Bob Woodward and Dustin Hoffman as Carl Bernstein had to ask an operator for an outside line to dial a call on a rotary phone in the newsroom. On the street, they had to hunt for pay phones and scrounge for coins to feed them. Back at the office, they typed their stories on paper, which was hustled across the newsroom to editors who attacked them with pencils and paste pots. From the standpoint of technology, we have made a lot of progress since Watergate in the art of getting and giving the news. But journalism has not fared nearly as well. Many of the middle-aged journalists who were attracted to the profession by the daring Washington Post investigation of a sitting president have been forced today into early retirement – or are desperately clinging to jobs in an industry they don’t recognize. With newsrooms routinely being cut by 20% and 30%, the survivors are required to file breaking news bulletins, write blogs, record podcasts and shoot video, too. While those remaining in the business have better tools in laptops, digital cameras and instant connectivity to a vast array of data, they also have way more work to do – and lots less time to do it. The more productive the press becomes, I fear, the weaker it is getting.